I love doing things by myself that test me. It’s easy to get a friend to help and often I do….well…sometimes. But if I think I will need a hand and then manage by myself I’m doubly pleased at what I’ve achieved. So today I’m feeling pretty good. The plastic base for a large sun umbrella had got cracked because the plastic had degraded in the sun, methinks the designers need a slap for this. It was the type that you fill up with water and of quite thin construction for the weight of water contained in it. Obviously as soon as it cracked it became scrap. It was badly made of poor quality materials but I had to come up with an answer. Various ideas sprang to mind but in the end I decided on the old school over-engineered approach and cast a concrete block incorporating the securing sleeve for the umbrella pole, it is plastic but much better quality and a lot thicker than the other stuff. I didn’t know how heavy concrete is when it set so rather than make one that might let the brolly blow over in a bit of a wind I erred on the side of “substantial”. One of my philosophies in life refers to how I gauge value, if something is worth having it should be intrinsically valuable such as gold or precious stones or it should be big or heavy. Well I didn’t have any gold or precious stones handy, very rare that I do actually, but I could make this thing big and heavy without any difficulty at all, so I did. The mould for the concrete was set up on the new improved bench incorporating the brolly pole sleeve and just to make it fancy I also added some tiles that were left over from the bathrooms. 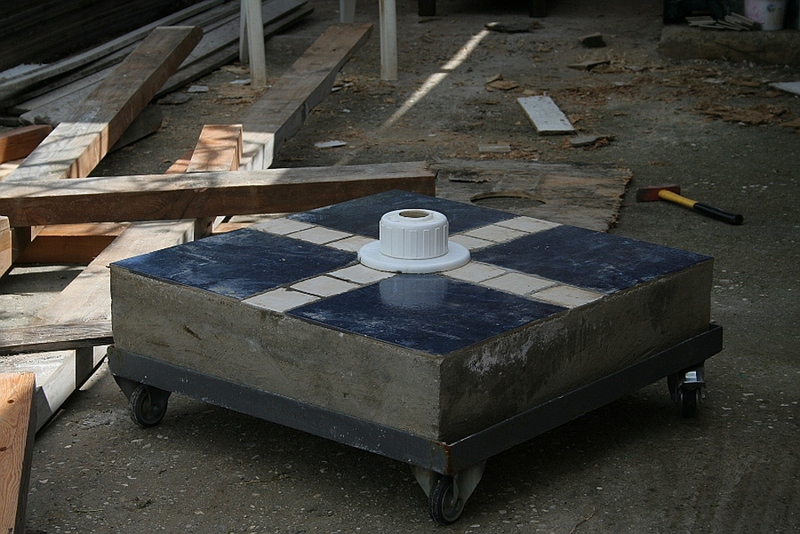 It was cast in an upside down orientation so that the tiles and sleeve could be kept in position simply by the weight of concrete. I was a bit surprised at how much concrete I had to make to fill the mould but felt quite satisfied that the resistance to falling over in a wind would impress Rear Admiral Sir Francis Beaufort (he of the Beaufort Scale). It was fine and I left it to harden for a couple of weeks. 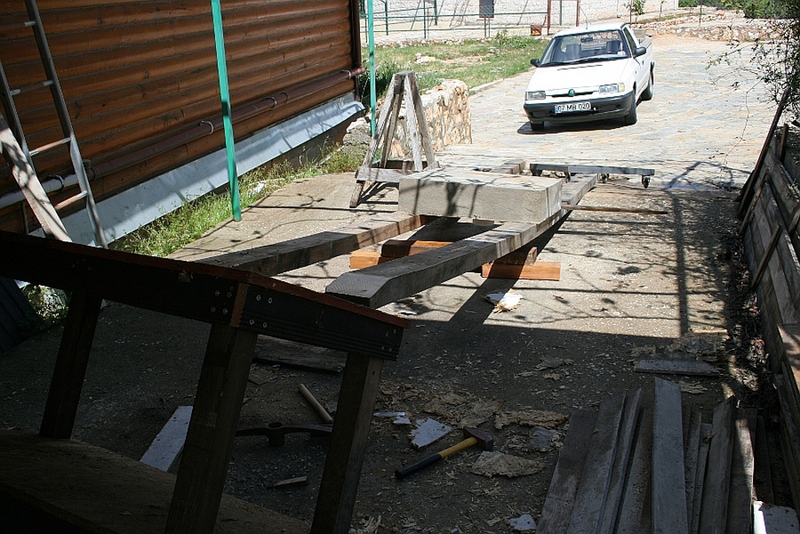 I also got the local metal fabricator, Ramazan, to make a frame with wheels so that it could be positioned as necessary. When the time came to take it from the mould and put it on the wheels it became obvious that my over-engineered estimate of weight was seriously awry and what I had guessed would be about eighty or ninety kilograms turned out to be a lot more than double. I had to get a long piece of timber to lever up just one corner of the damn thing! Looking on the internet I found a concrete calculator into which I could put the size and find out the weight. I was a bit embarrassed to discover that the thing weighed more than a quarter of a metric tonne, mind you I was very pleased that my bench carried it easily. So it sat there imprisoning my lovely bench until today. I have sat in my spare room working on my computer with this thing sitting outside the window laughing at me for about eight months. I’ve drawn little sketches and imagined how it could be shifted and this morning I had enough of it and decided this was the day of the move. Despite it’s ridiculous weight and the fact that the brolly pole sleeve is plastic and therefore breakable it ended up being fairly simple to achieve the desired result. You’ll note I said “simple” and not “easy”. 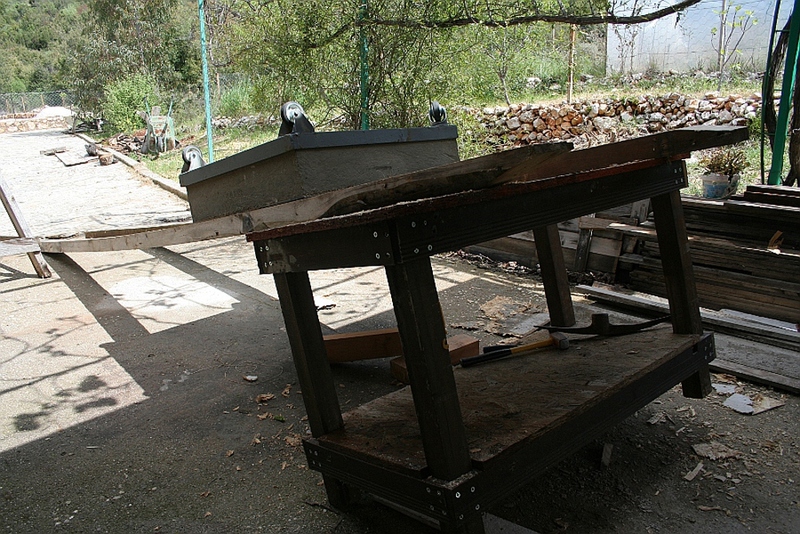 A couple of big pieces of timber formed a pair of slides and essentially it just slid down and was turned over using other timbers as levers. 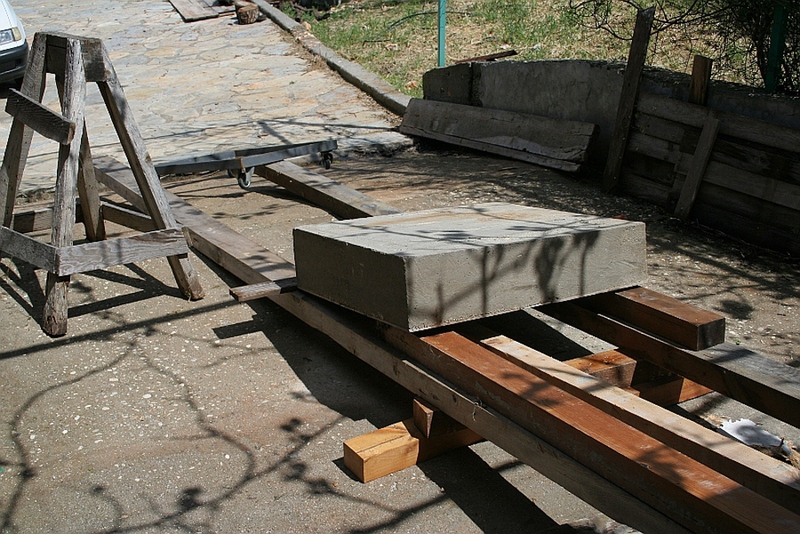 Stopping it from sliding and getting it turned over were juggling acts with smaller bits of wood and levers. It took a certain amount of effort and as I type this my shoulders and arms are still a bit shaky, think I might have a long hot bath tonight. Here are some photographs, being on my own it was not possible to photograph all the operations but you get the idea I’m sure. The message? Oh yes….Bob you can come back now, I’ve done it. 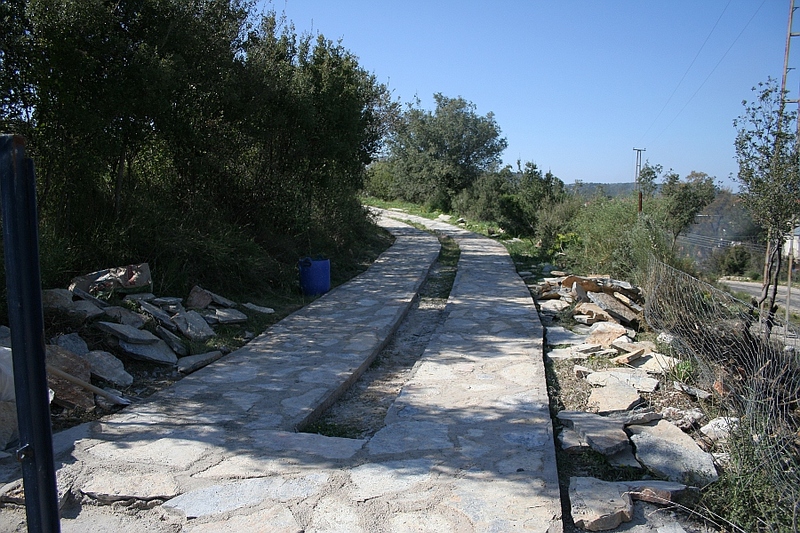 The flat stone on the drive has now been finished all the way down to the gate leaving a section halfway along it to be finished with gravel to give it a bit of a rustic look (and to save me money). The middle will be filled in wıth soil and planted with wildflowers, I’ve got a couple of packets of seeds from UK. I decided to finish off the entrance from the road myself and that will be done in the next few weeks. My neighbours Mustafa and Hanife were pleased to come and help chop down a lot of bushes at the bottom end of the garden so that they could take the thicker branches and trunks home for firewood. It’s a big step towards creating a little themed area down there, don’t know what the theme will be yet but the inclusion of a space to put a tent or chalet is in my mind. 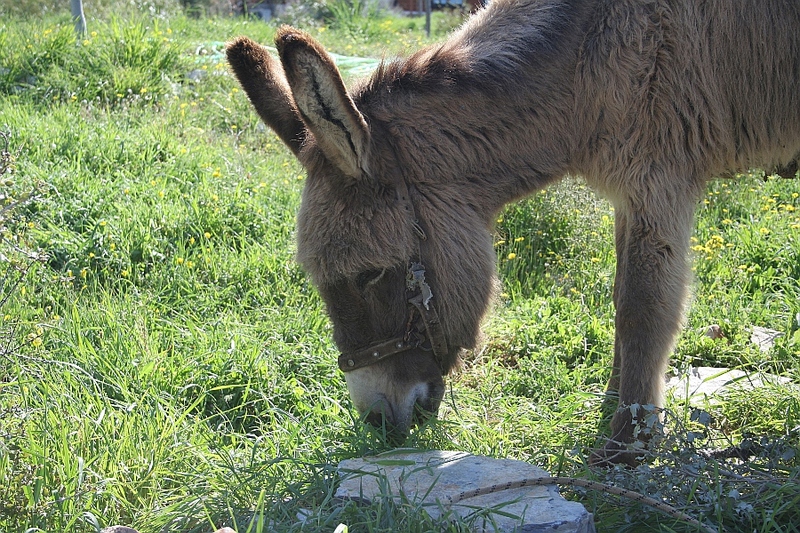 They brought their donkey to have a good feed on some of my grass and weeds too. Molly the dog took a liking to running round it barking which caused a certain amount of consternation to begin with then I understood that the donkey seemed to be having a bit of fun with it too so I left them alone. Their dog Aslan came too and there was much racing around the garden and noisy play-fighting. 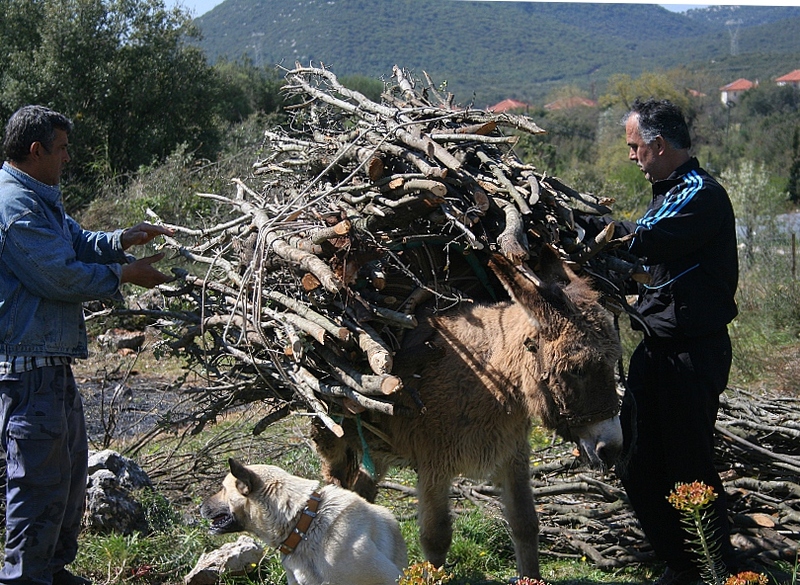 In the evening Mustafa (left) and his brother in law came to load up the donkey with the wood and take it down to his house, the load was a bit lopsided and wobbled around a bit, I thought it was going to fall off at one point but it made it safely.